The Philippines' leading budget airline, Cebu Pacific Air, ordered 16 ATR 72-600 from ATR, the European Turboprop aircraft manufacturer. At the Paris Air Show, Cebu Pacific and ATR announced that the order includes options to acquire an additional 10 ATR 72-600, valuing the total aircraft order at US$673 million, based on current list prices. The transaction will see Cebu Pacific double its turboprop fleet size, subject to the execution of final purchase documentation. The order is part of Cebu Pacific's fleet renewal program. Cebu Pacific currently operates a fleet of eight ATR 72-500 aircraft, which will be retired as the new aircraft enter service. The entry into service of the ATR 72-600 will see Cebu Pacific with new generation aircraft to meet growing demand in the Philippines for inter-island services. About 330 ATRs – including more than 100 ATR 72-600s – are currently operated by 55 airlines in the Asia-Pacific region, where for many years now, they have been seen as the reference regional aircraft. 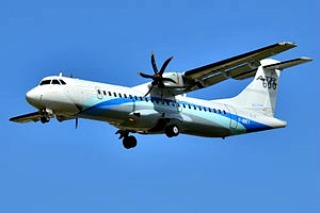 The ATR 72-600 has the lowest cost per seat mile in the 70 seat segment, with significantly lower fuel and maintenance costs compared to similar class aircraft. On their new order from ATR, Lance Y. Gokongwei, President and CEO of Cebu Pacific states: "We have been operating ATR aircraft since 2008, and they have enabled us to bring safe, reliable, and affordable air transport to smaller cities and islands throughout the Philippines. This order is an affirmation of our commitment to extend the convenience of affordable air travel to even more communities. We are very pleased to be the launch customer of this new configuration of the ATR 72-600, as this will allow us to offer our customers more seats at even lower fares." Patrick de Castelbajac, Chief Executive Officer of ATR, declared to be "very happy to continue our partnership with one of the leading airlines in South-East Asia and to contribute to the expansion of its network throughout the islands of the archipelago. Cebu Pacific will also be able to benefit from the vast support network for ATR operators in Asia. When their first ATR 72-600 arrives, there will be five ATR pilot training centers in the region." CEB currently operates a fleet of 55 aircraft comprised of 10 Airbus A319, 31 Airbus A320, 6 Airbus A330 and 8 ATR-72 500 aircraft. It is one of the most modern aircraft fleets in the world. Between 2015 and 2021, Cebu Pacific will take delivery of 7 more brand-new Airbus A320 and 30 Airbus A321neo aircraft.